Have you lost a loved one under tragic and avoidable circumstances? Are you pursuing a wrongful death claim because of this loss? We are California wrongful death lawyers at Booth & Koskoff, and we are here to help you seek justice. Losing a loved one under normal circumstances is difficult enough to accept, but when a loved one passes away as a result of negligence, the loss is even more difficult to recover from. Wrongful death claims are a way to seek justice when the negligence of a person, company or governmental entity causes someone's death. You may have a right to file a California wrongful death lawsuit to recover damages for such a loss. A wrongful death claim will cost you no out-of-pocket expenses. Our compensation is based on the recovery we obtain. From our first wrongful death case in 1984, we've successfully resolved many wrongful death cases in California. We are passionate California wrongful death lawyers who are here to help. 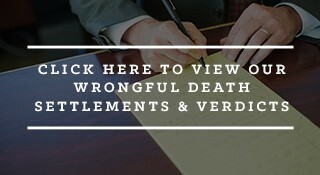 Below you'll find a list of some of the wrongful death verdicts and settlements we've obtained for our clients. If you believe we could help you with your wrongful death lawsuit, contact us for a free evaluation of your case. We have wrongful death attorneys ready to help you in Torrance, Los Angeles, Bakersfield, Riverside, St. Helena and Palm Desert. From our first sexual abuse case over twenty years ago, we’ve successfully resolved many sexual abuse cases in California. We are highly skilled and committed Los Angeles sexual abuse lawyers who are here to help. Below you’ll find a list of some of the sexual abuse verdicts and settlements we’ve obtained for our clients. A sexual abuse claim will cost you no out-of-pocket expenses. Our compensation is based on the recovery we obtain. If you believe we could help you with a sexual abuse claim, contact us for a free evaluation of your case. Booth & Koskoff is a California personal injury law firm that specializes in wrongful death and catastrophic injury cases. With over three decades of experience, Booth & Koskoff, elite California wrongful death lawyers, have won more than 80 verdicts and settlements of $1 million or more for California clients. Early on the morning of February 12, 2005, Sam Lee, a 48 year-old father of two, lost his life after the car he was driving collided with a horse on a Ventura County road. We successfully proved that an escaped tiger from an improperly permitted and enclosed a nearby animal sanctuary may have contributed to Mr. Lee’s death. On April 22, 2010, 22-year-old Marine corporal Samantha Schultz, who had recently returned from a tour of duty in Iraq, lost her life on a quiet street in north San Diego County. We successfully pursued a dangerous roadway case against the County of San Diego, which owned and controlled the road. Want to see more cases like these?